It's here! 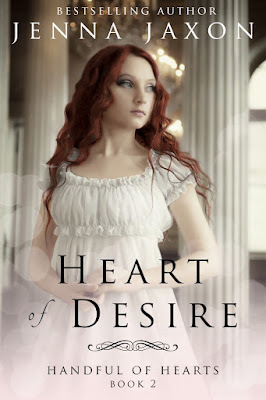 Jenna Jaxon's HEART OF DESIRE, the second of her Handful of Hearts Regency series launched this week and Jenna's here to give up a glimpse of her latest--and to tell us a bit about the Regency rules of courtship. During the Regency era there were very strict rules for courting couples. They could never be alone together unless they were chaperoned, were betrothed, were in an open carriage, or on horseback. With all these strictures, our modern sensibilities make us wonder how they ever found time to get to know one another. There were, however, several outings the couple could indulge in and not create a scandal. A gentleman could, in all propriety, accompany a young woman to several public sightseeing landmarks without censure. Places such as the Tower of London, Hampton Court, Hyde Park, or the British Museum to see the Elgin Marbles. As long as the couple were in full view of the public, they could walk and talk together and preserve the proprieties. Carriage rides were a very popular way for a couple to indulge in private time together while courting. The carriage had to be open, but could also be a sporty curricle or a high-perch phaeton (the sports cars of the Regency period). Rides were usually taken in Hyde Park during the most fashionable hours between 4:30pm and 7:30pm, the point being to see and be seen by everyone else in the ton. A favorite outing was to go to Gunter’s Tea Shop, one of the most fashionable light eateries in London. Gunter’s was famous for their ices and sorbets. Located in Berkley Square in Mayfair, it was another establishment where the ton came to see and be seen. The Georgian Index reports that it became popular to eat the ices outside. “Gunter's Tea Shop was the only establishment where a lady could be seen eating alone with a gentleman who was not a relative without harming her reputation. Another outing, also very popular and a bit daring, was a trip to the Vauxhall Pleasure Gardens. This was a vast park of several acres of land that had different kinds of entertainments at night, from musical presentation to fireworks. Vendors sold various wares and although the best lit place in London at night, it still boasted several darker pathways down which a couple might stroll for a bit more private conversation. Usually ladies formed parties to attend Vauxhall insuring chaperones for a couple until they had agreed to a formal engagement. These outings were an approved part of courtship during the Regency. 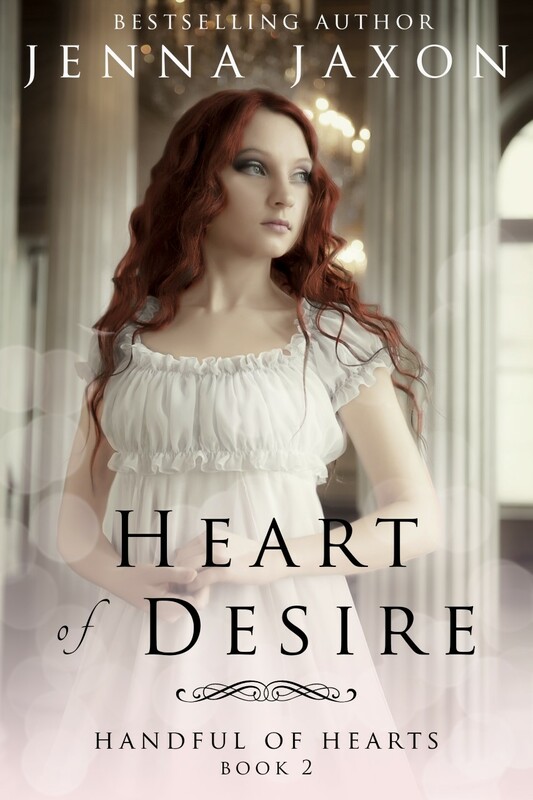 In Heart of Desire, my courting couple make use of many of these excursions as they try to get to know one another, as did countless real couples of the period. 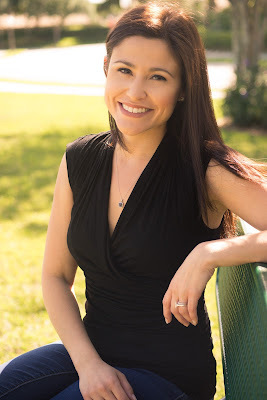 Now here's a glimpse of Jenna's new book. Haversham, was the rudest man in London. Well, his lordship was about to discover that Kate Locke was not one to suffer fools lightly. “Indeed.” Lord Haversham turned them skillfully at the end of the floor. “I would say it showed a want of character in your brother for allowing you to dance it with me. The waltz should be danced by married couples and no one else.” He pulled her close against him, so their bodies almost touched. She gasped at her proximity to the rogue. How dare he make a spectacle of them on this crowded dance floor? “You see?” he whispered, peering into her face, his gaze intent upon her mouth. All she could see were his cool gray eyes, as the crisp scent of his sandalwood cologne filled her nose. “I’ll see to it he horsewhips you if you don’t let me go.” Kate gave a hopping step and smashed her foot down on top of his. Lord Haversham lurched forward, actually falling onto her. For the briefest moment, they stood pressed together in a warm embrace that made Kate tingle all over. Then outrage swept through her, and she pushed him away. “How dare you,” she seethed, trying to pull away from him. “That was your fault, and you know it. And if you make a scene that results in me having to marry you, I swear I will lock you in the tower at my grandfather’s castle and throw away the key.” Lord Haversham righted himself and smiled at her with clenched teeth. Happy Friday! Today we've a special treat. 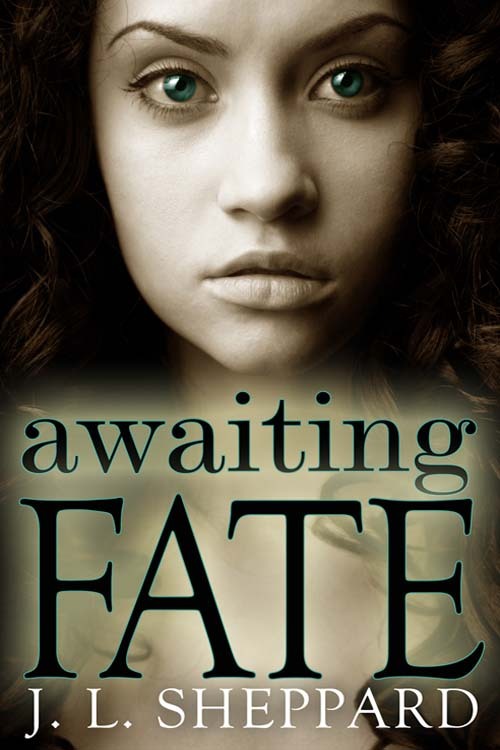 J. L. Sheppard is announcing a special sale for AWAITING FATE. Her latest FATE FORGOTTEN, Fated Immortals 2, will be released August 26. So this is your chance to buy AWAITING FATE, Fated Immortals 1, for just 99 cents! I was so taken by the excerpts that I included two, presenting touching views of the heroine's and hero's point of view in a scene. Have a great weekend, everyone. Cain Thaler’s lived more than four hundred years fighting rogue immortals, avenging the family he’d lost. It’s all he’s needed, all he’s wanted. That changes the fateful day he lays eyes on his fated mate. Olivia Waden, a werewolf princess, is nothing like him. Unwilling to give her up, he sets a plan into motion: ignoring his need to claim her, he befriends her. Despite Cain's best efforts at friendship, Olivia has fallen hard for him. It is him she dreams of, him she wants as her fated mate. But she is sure he doesn't feel the same way. In way over her head, she has no option but to run away from the only man she's ever loved. Will Cain find Olivia before it's too late or will their differences tear them apart? She lifted her head and admired the stars. From the corner of her eye, she realized he’d done the same. “What do you want most in the world?” he asked, surprising her. Shifting her attention to him, her eyes sought his. Just in time, he turned looking her way, waiting for her response. With that one somber look, she realized the glimmer always present had dimmed. You, she thought in response to his question, but left the word unsaid, wondering exactly what to say. You, he thought but left the truth unsaid. What could he say? He wanted to seek shelter in her arms and comfort in her touch. He wanted to come home to her face, her smile—her. He wanted her barefoot and pregnant with life they created growing inside her. He wanted her to love him so much she couldn’t fathom living and breathing without him. He was already there. “I want a lot of things, too many,” he finally said. A cop-out, so the moment he’d spoken the words, he regretted them. He needed her to trust him, but his situation made it difficult. He couldn’t tell her the truth, only a version of it without revealing too many details. “I want my fated to love me,” he said it so simply. He hoped she would respond. More than anything he wanted her to ask him if he’d found his. Because he knew if she did, he’d never be able to lie and, finally, she’d know. He waited for her to say something, but she never did, so he found himself gazing at the stars praying he could magically cure her sadness. It was inevitable to want more, more of her, all of her, but for now, sitting in the dark, gazing at the stars was enough. Purchase Awaiting Fate for 99 Cents. This sounds great, J. L. Please come back when your new book is out!